Blonde hair. Brunette hair. Red Hair. Bright Fuchsia Hair. With so many awesome hair dyes available how is it possible to just pick one color? We don't know about you, but we can't decide! We started looking for other options that would allow us to have a funky 'do without having to make a series commitment to a singular hue and we are pleased to say that we've found the perfect solution. 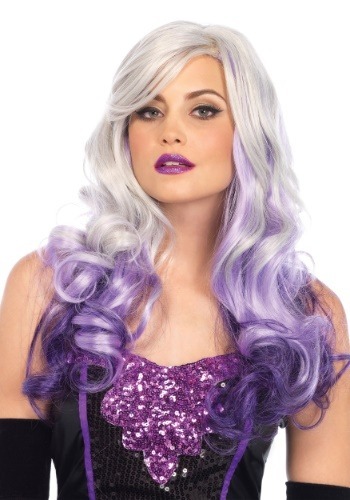 Introducing...*drum roll please*...the grey and purple ombre wig! You can stop fretting about committing to just one color because this wavy wig allows you to rock a trendy silver hairstyle with rockin' violet ends. The side-swept bangs will frame your face perfectly and the long layers will give you all the volume you could ever want. You can wear this wig whenever you feel like changing up your hairstyle. Pair it with a witch costume for a spellbinding look that won't go unnoticed!